A1 and Jon Bolen take on The Eh Team in a 2 on 3 Handicap Tag Team Match! BAY CITY, Mich. — Ultimate Championship Wrestling announces another huge match-up for Back to School — Old School on September 16, 2017 at the Prime Event Center in Bay City, Michigan. 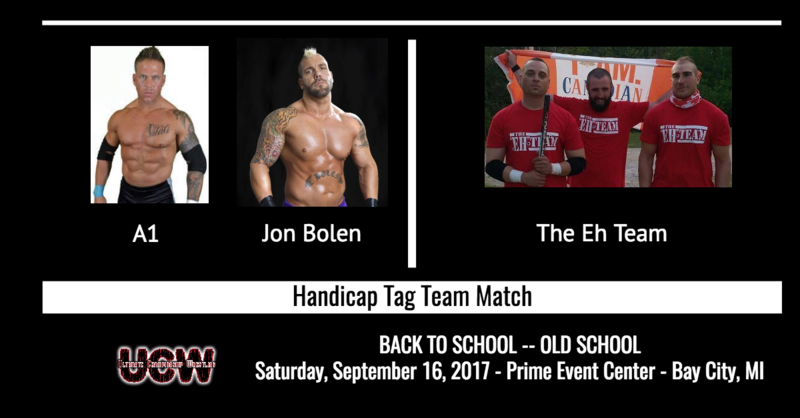 A1 and Jon Bolen will be taking on The Eh Team in a 2 on 3 Handicap Tag Team Match. More big match-ups are yet to be announced as we build towards UCW Back to School — Old School and the kick off to the fall season with UCW. Don’t miss out on this big event and order your tickets now!